Size(approx): Interior adjustable draw string, will accommodate 56-58 CM/22.5inch-22.6inch. A great accessory to your clothes. Perfect for everyday wear or a fancy event, like outdoor tea, kentucky derby, grand national, melbourne cup, or eligious gatherings, holiday, picnic, sports cycling, camping, hiking, fishing, boating. Great for ladies and girls. You will find it is the perfect present for your girlfriend, mother or friends. church hat, wedding hat, kentucky derby hat cap, floral organza hat, lady hat, sun hat,summer hat, beach travel hat. 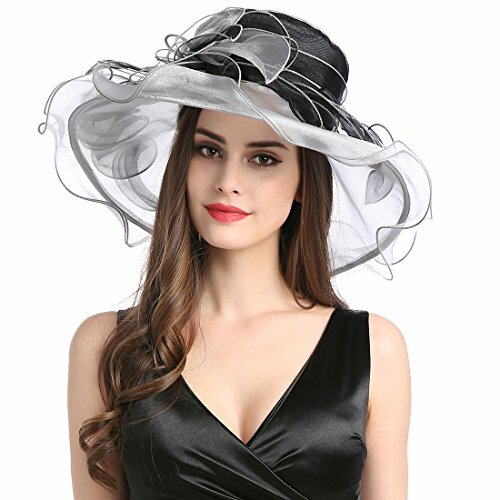 Elegant Women sun hat for Church / Kentucky Derby/Ascot Race/Cocktail Party / Wedding /race day events/ Tea party / Outing travel /shopping/formal occassion/outdoor hat. If you have any questions about this product by MissCynthia, contact us by completing and submitting the form below. If you are looking for a specif part number, please include it with your message.